Published By – Cooper Music Ltd.
Includes a 4-panel foldout booklet with notes, credits and photos. Tracks 1, 2 previously released as single, Deram, DM.107, UK, 1966. Tracks 3, 4 previously released as single, Deram, DM 123, UK, 1967. Tracks 19, 20 previously released as single, Deram, DM 135, UK, 1967. 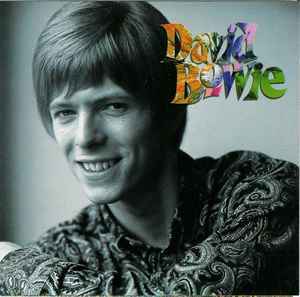 Tracks 21 to 23 previously released as part of compilation "The World Of David Bowie" Decca, SPA 58, UK, 1970. Tracks 24 to 27 previously released as part of compilation "Love You Till Tuesday" Deram, 820 083-1, UK, 1984. Some copies have a sticker on front cover.